P. Parker was admitted in 2006. She had a G-tube and was dependent on staff for her activities of daily living. Along with speech therapy, she was started on a diet of pureed food and thickened liquids. Soon she progressed to a mechanical soft diet and thin liquids at which time her G-tube was removed. She began to get out of bed and into a wheelchair and soon learned to propel herself. 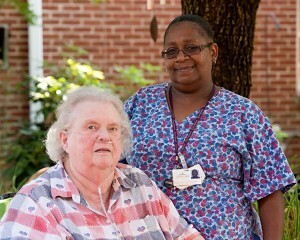 Ms. Parker now attends activities, eats in the dining room and enjoys socializing with other residents and staff. A. Preddy was admitted in 2010. She required extensive assistance with all activities of daily living. She was in and out of the hospital several times with the final stay was in September 2011. After that hospitalization, she began working earnestly with therapy and soon was walking, toileting and transferring with assistance. Ms. Preddy was discharged home in February 2012. A. Keesler is a long term resident at the Kerr Lake Nursing and Rehabilitation Center. Due to an unfortunate accident, Mr. Keesler lost both of his legs. Upon admittance, it was necessary for him to re-learn how to care for himself. Occupational therapy taught Mr. Keesler to perform activities of daily living skills. Through adaptive techniques, he is now able to care for himself with little to no help. Most recently, Mr. Keesler began prosthetic training and with the help of physical therapy, he is able to walk again with minimal assistance. Mr. Keesler has shown tremendous strength and willpower to overcome barriers related to being a bilateral amputee. With the skilled interventions from therapy, he is now living a happy productive life in a caring long term care environment, providing him with the support needed for his success.